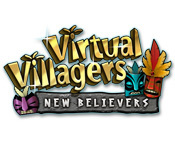 Virtual Villagers: New Believers is rated 4.2 out of 5 by 37. Rated 5 out of 5 by Discordia33 from Best of the Virtual Villagers Series, hands down! 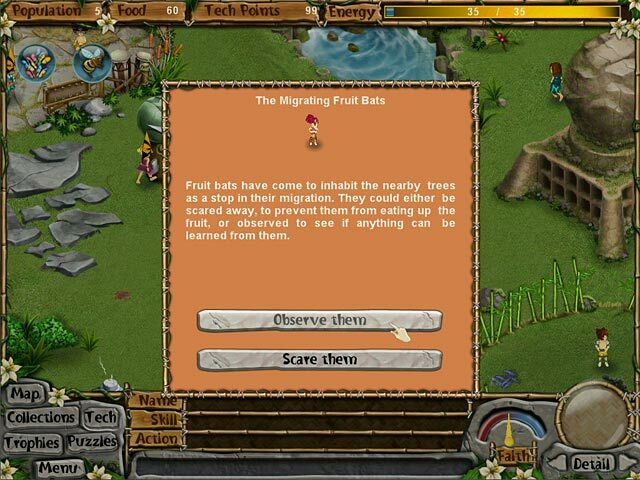 I have played all of the virtual villagers series and always enjoyed this real time game in which I could play for an hour or two at a time or check in 10 minutes a day when I have a busy week. This is time consuming to beat and the puzzles are very difficult. This differs from the rest of the series in that you are on an island already occupied by "Heathen" villagers that restrict your movement on the island with their aggression. You must slowly convert the heathens with your new skill of "Devotion" into believers to gain access to vital portions of the island one by one. Your villagers also earn divine powers based on population that can do things like spawn butterflies, create lightning or rain, revive a villager from the dead and even regress an elder back to childhood with their skills intact. This is the only game of the series that I played long after I beat all the puzzles to earn every trophy in the game and even set a personal goal of breeding villagers maxed in all skills until I had each and every unique looking male and female in my little perfect utopia. Best of the bunch.... I would recommend this to anyone! Rated 5 out of 5 by wendyal from Love this game for whole family Just one more in a series of virtual villagers . If they keep making them ,I'll keep buying them . Rated 5 out of 5 by Dakotasadler from adventure game I love this game. I think it is fun and would recommend it. Rated 5 out of 5 by Saraloraine31799 from I LOVE THIS GAMES!!!!!!!!!!!!!!!!!!!!!!!!!!!!!!!!!!!!!!!!!!!!!!!!!!!!! I LOVE THIS GAMES!!!!!!!!!!!!!!!!!!!!!!!!!!!!!!!!!!!!!!!!!!!!!!!!!!!!! Rated 5 out of 5 by mohaganyeclipse from Always A Favorite! I'm an avid fan of the VV series and I really look forward to any new games from this developer, so I hope we'll see another one soon! I enjoy discovering the secrets of the islands as each game is unique in what there is for your villagers to figure out (excepting the hunt for food that is). These games are in real-time play so they can leave them for a day or two, depending on what speed its set at. Its important to always check on them to make sure they haven't all starved to death or something because then you'll have to start over, thats happened to me on several occasions so I know I'm not village chieftain material :). Rated 5 out of 5 by sarasally from Amazing! I love the challenge but why is there 5 virtual villagers and when they are made by the same company only 2 virtual families. I like virtual families a bit better so I want to see more of them. I love all the virtual villagers and hope you continue making them.This and The Lost Children are probably my favorites. Rated 5 out of 5 by buffy145 from Straightforward Puzzles and New Challenges I don't know whether I prefer this one or Tree of Life, but New Believers brought some new things to the table that I really enjoyed. The heathens can be quite a hassle, but I found a way to get the orange masks to go away without it being so annoying. I use one of my villagers to lure the heathens to the area next to the broken aqueduct. I trap my villager at the top of the waterfall and the heathens keep trying to chase them away, but they cannot go forward because the fall keeps them from doing so and my villager can't get away because the aqueduct is in their path and the heathens right in front of them. That way, they'll be stuck in there until you decide to take your villager out of the waterfall. Keep luring all the orange heathens there and you'll only have to worry about the red masks, and there are only three or four of them in the game. After you've destroyed the knowledge and hunger totems, there'll be one in the dry lake, one helping near the mausoleum and the other one will be swimming next to the rainbow totem. At least that's what's been going on the part of the game I'm in. I've read some reviews saying this one is the hardest of them all, but I actually find it one of the easiest? With all the others I had to look up at least three puzzles on the internet because I couldn't make it work in the game, but I have a feeling New Believers isn't gonna bring this problem to me. The puzzles are pretty straightforward so far, and if you really have that much trouble, you can always go on yahoo or whatever and they'll have detailed instructions on what to do. At least I suppose there will be, there have been for all the others. The real question for me here is when VV6 is coming out. I have a feeling the answer for that question is 'never', which is a pity. I really hope they find inspiration to keep going. Rated 5 out of 5 by mach37 from By Far My Personal Favorite You read the title right! Of all the V.V. Games I have EVER played, this is probably my favorite. I can't explain all of it in a paragraph so I'll do a Q and A. Q: Why would you enjoy a game where you destroy a religion, strip them of their masks, and tear down their totems? A: Obviously this has been asked before, so I'll make this quick. They are NOT happy, have you ever even waved over their totems to read what they are called? "Hunger" "Sadness" "Anger" etc. If this were real, then the people would be holding on to them because they probably hope they will care for them, so If converted to a hopeful... Q: Why is it so fun? I mean, they do everything FOR you! A: No they don't. You have to make them achieve goals, nothing will just get up and automatically serve you ya know! Q: Do you like the Angry Heathens? A: Honestly, I don't. But I will say one thing... IT IS SUPPOSE TO BE HARD! Without those people then it would just be too easy! This is my personal Question and Answer page. This is perfect for the addicted Gamer. I hope you found it helpful! Rated 5 out of 5 by swampie from So Much Fun! I have played the Virtual Villagers series and like them all very much. In the New Believers there are new challenges and lots more to do to make the village a success. I enjoyed seeing the children, including the suprisingly precious heathen rascal, enjoy the butterflies. The games of tag and nursery school are sweet. The villagers are a tad small, but not so much as to affect the play. One of my villagers looked like Dolly Parton and another like Stooge, Larry Fine. I had my favorites and hated to see the old villagers die. Play this game. It is great fun and a welcome break from day to day stresses. Rated 5 out of 5 by nannypapa14 from Amazing I love this game! I could play it all day.